As a prerequisite for this article, please review Reschedule and reassign meetings to ensure your preferences are turned on for this functionality. The purpose of this article is to help Admins create a custom "Reassign" button in the Salesforce Event. 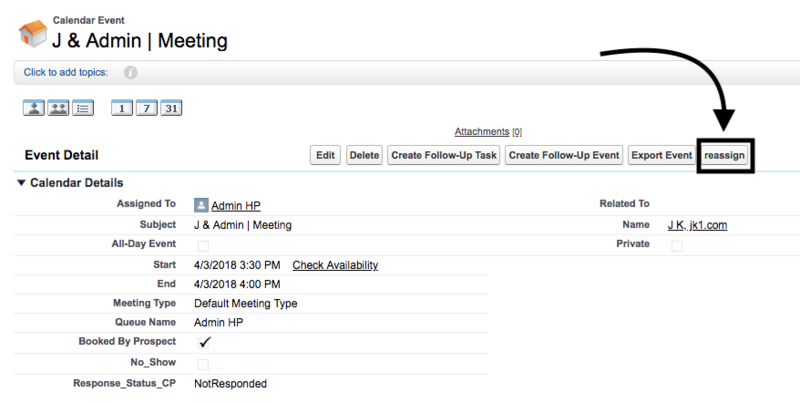 This functionality will allow users to reassign a meeting to another user directly in Salesforce. Note: Salesforce Admin permissions required. 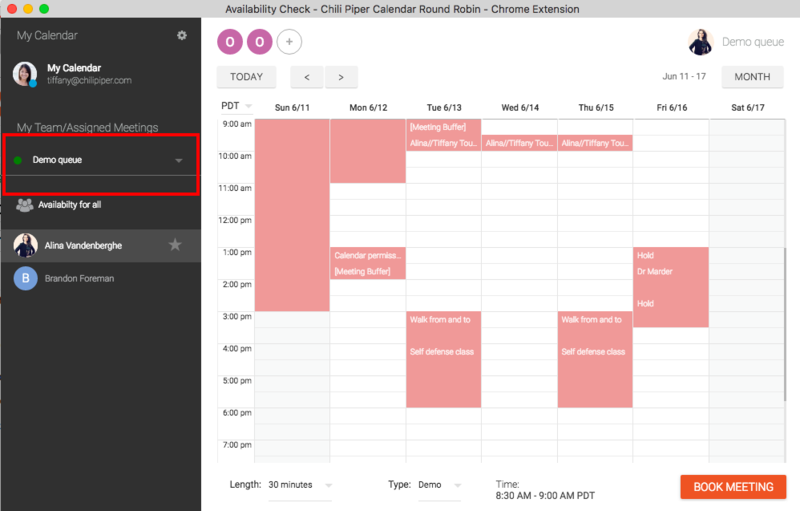 The button will not work for meetings not booked with Chili Piper. Click "New Button or Link"
Your button setup should match the picture below. Navigate to Customize -> Activities -> Event Page Layouts . “Edit” the Event Page Layout. From the Buttons category in the palette, drag "reassign" into the Custom Buttons area on the page layout. Then, save and the button is configured. 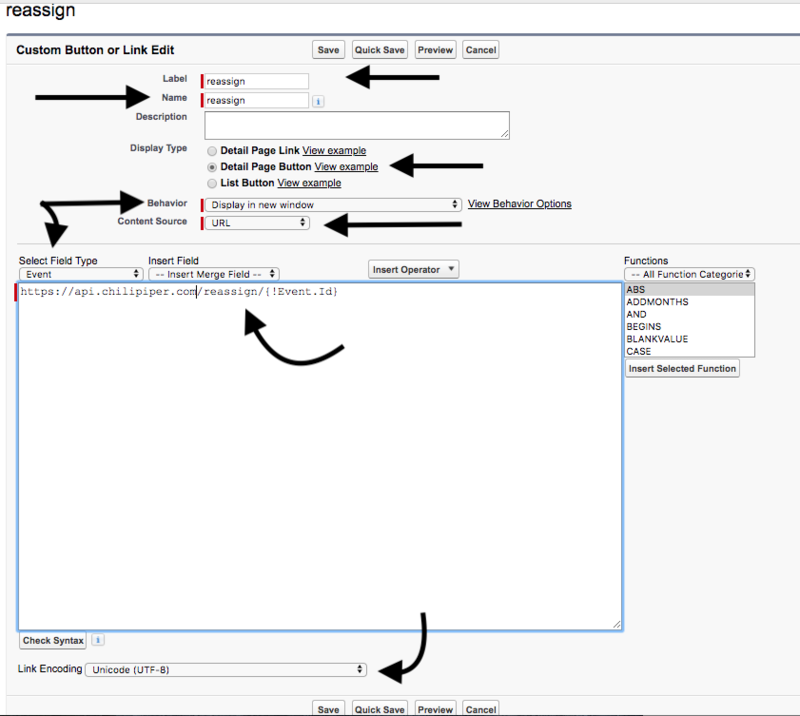 Go to the "Object Manager" and select "Event," then "Button, Links, and Actions"
Navigate to Setup -> Object Manager -> Event -> Page Layouts . “Edit” the Event Page Layout. The Button you created should appear in your events. Once clicked, select the correct queue, then select the rep you'd like to reassign the meeting to. You're all set - If you experience any issues or need additional help getting this set-up, please email support@chilipiper.com and we'll be in touch with you as soon as possible!